Mantoushe ... focus on raw natural beauty. 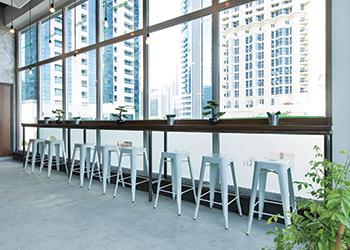 Set amidst the skyscrapers of Dubai’s Jumeirah Lake Towers (JLT) is Mantoushe restaurant, which boasts sunlit and urban space that evokes an industrial theme. A highlight of this outlet, however, is that the finishing has been crafted from recycled material including pipes and wood. Another interesting fact is that the owner and CEO Sophia Sleiman, herself, has created the design of Mantoushe. 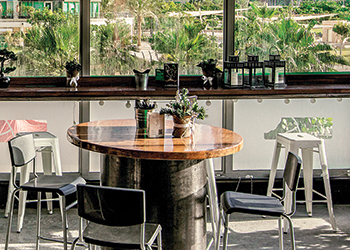 The wide-open, floor-to-ceiling windows that wrap around the corner of the restaurant create a seamless transition from indoor to outdoor dining on the patio. 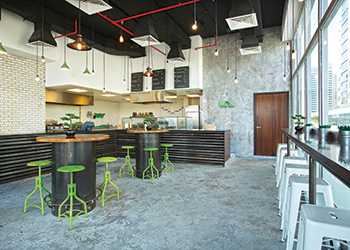 Commenting on the design concept of the outlet, Sleiman, who is also a food scientist, says: “I was in New York when I made the decision to set up Mantoushe. Standing in the bustling streets in the heart of Manhattan, I wanted to take a piece of that raw energy and transport it back to Dubai. So while working on the design I always asked myself before installing or introducing something new, would this work if Mantoushe was in New York? Floor-to-ceiling glass ... ample light and excellent views. “We wanted our design to be very simple with very minimal changes to the materials we were using – an industrial, urban vibe that would fit right in if picked up and dropped on a street in New York. Just like our food, we wanted the raw natural beauty of all the elements we implement to shine through,” she says. She says Mantoushe’s design goes hand in hand with her concept and principles for the outlet: honest, real and all natural. “We tried to use recycled steel and refurbished wood everywhere we could. We honestly believe in the beauty of urban recycled furniture; there is something appealing about steel and wood combined. We were also keen about making sure the kitchen is 100 per cent visible to our customers. “It is a principle I abide by: honest food. Our customers deserve to know exactly what they are eating, and we are proud of what we are serving so why not put all that out in the open,” she remarks. The most striking feature of the outlet, according to Sleiman, is the counter. It has been made with layered 2- and 3-inch pipes that were brought in from construction sites, sandpapered and then sealed with a transparent laminate so that one could see the steel. Centre tables made from chilled water pipes. Another striking design feature is the floor-to-ceiling glass in the dining area. The 5-m-high glass is a source of light and also offers excellent views of the park in front of the outlet. “Glass also makes the space feel huge, bright and open,” says Sleiman. “The walls and floor have been hand-painted by a very talented UAE designer and his team who blended different shades and textures of silver with barely noticeable colours of rust. Commenting on her choice for using recycled steel and salvaged wood, she says: “The materials were selected both for their beauty and environmental value. I come from a family in construction and grew up visiting sites with my father. I always thought there was so much beauty and purpose behind every pipe so we tried to use as much as we can from construction yards in Dubai. Our centre tables, for example, are made from chilled water pipes and we used smaller pipes throughout the store on the counter and the side tables. “The outlet was very straight forward. We fully abided by all the standards set by the Dubai Municipality and other authorities for restaurants,” she concludes.